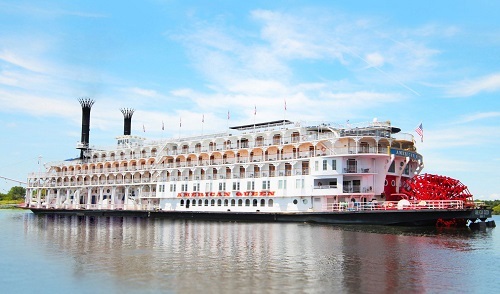 Discover the heritage and culture of America with a cruise onboard the elegant American Queen, an authentic paddlewheel steamboat. Luxurious amenities display the opulence of the American Victorian era while also featuring every modern convenience. Each stateroom features lush bedding and fine linens as well as in-room bottled water and fresh fruit. Onboard cuisine is gourmet and something to satisfy every craving is available 24 hours a day, from grand meals in the Dining Saloon to American favorites in the Front Porch of America. Complimentary wine and beer are available with dinner. There is always something to enjoy onboard during your leisure time. Enjoy a swim or a workout in the pool or athletic club or borrow a book in the Mark Twain Gallery; after a day of exploring, enjoy nightly entertainment that includes everything from showboat style performances to calliope concerts to swing dancing.